On a warm fall evening about 1,000 people gathered to party and release paper lanterns into the night sky. 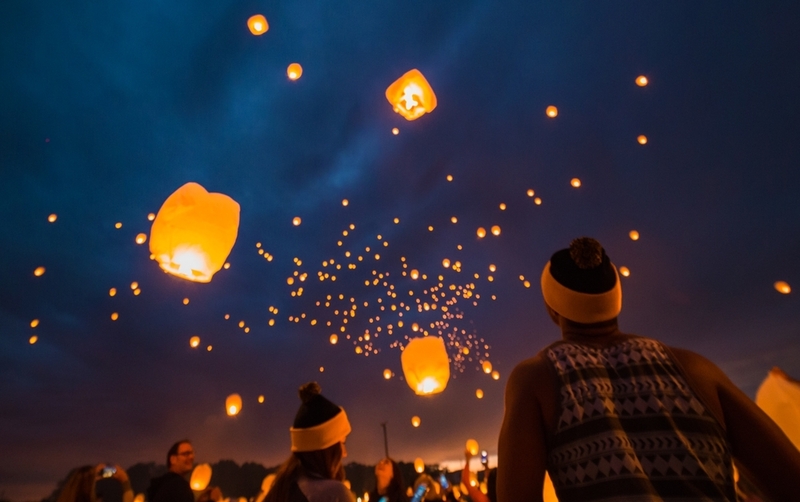 I had seen photos of similar celebrations in Asia and I've seen the movie Tangled about 100 times with my daughter so I knew how beautiful these floating lanterns can be. When I found out that this event wouldn't require me to visit a Disney park or hop on a plane to Thailand I was thrilled. There were several creative and technical challenges that needed to be considered if I was going to come up with an original image. I always start by addressing the creative side first. From there any technical issues that that we need to overcome can be identified and solved. A quick google search of these festivals will bring up millions of images. They mostly share a pretty typical look - shot from ground level, mostly looking up, and almost always with a boring black sky. As a photographer I'm always trying to think of new ways to approach familiar scenes so these lanterns were going to be a fun challenge. I immediately knew that I wanted a dynamic shot that didn't look like the others that I was seeing. Placing the camera over the crowd would make it seem like the viewer was floating up with the lanterns and provide the unique look I was going for. I just needed to figure out a way to elevate the camera. How hard could that be? I wasn't about to drag a ladder out to the middle of this field at night and I couldn't exactly tie my camera onto a lantern. I don't own a drone (yet, although flying a drone through a lantern launch would be pretty amazing). A painter's pole did the trick quite nicely. Home Depot has a couple of models that work perfectly for this type of situation. The model I used collapses down to about 4 feet long and extends to around 12 feet. Once I threw an adapter and a small ball head on the pole I was ready to start thinking about the rest of the shot. How would I trigger the camera if it is 10 feet up in the air? You could use a remote cable or an intervalometer set to shoot continuously. Another option would be something like the Camranger which allows for remote shooting. I happen to shoot with the Canon 6D which has built in wi-fi that pairs up with my phone. This setup allows me to see what the camera is seeing and operate the camera from a decent distance away. It is perfect for this kind of situation but just be aware than it can be a little difficult to hold the camera in mid-air and operate the phone at the same time. Just be careful not to drop the pole. Now that the camera was where I wanted it to be I had to think through the situation. It was going to be dark and the light in the scene was going to be a small piece of burning wax. The lanterns were going to be moving but since I had never been to one of these events before I had no idea how quickly. There was a large crowd there and I didn't want to interfere with anybody around me. I wasn't sure if the most dramatic shot would take place 5 seconds after people let the lanterns loose or 5 minutes later. Finally I had the camera up high enough but was the shot framed right? The exposure questions was the biggest one I had to deal with. Since the painters pole is essentially a really tall monopod I could get away with a relatively slow shutter speed. I could have gone a little slower but I didn't want any movement in my shot as the lanterns floated to the sky. I ended up guessing 1/40 sec. would work. I opened up the aperture almost all the way. To make those numbers work I needed an ISO of 3200. That is higher than I usually like to shoot but the scene was so dark that I really didn't have any other choice. A slower shutter speed would have resulted in a blurry image and if I opened up the aperture any more I would have lost some sharpness and DOF. ISO 3200 was the only option at that moment. I tried to see if ISO 1600 would work but it was simply too dark. I fired off a couple test shots at ISO 3200 and they looked fine so I went with it. Soon we were given the signal to release our lantens and I started to shoot and kept shooting. I could see that some of my shots weren't quite lined up correctly so I leaned the pole backwards to try and tip the camera up. This works well but can be pretty awkward at times as the camera and pole combination is extremely top heavy. Then I just kept shooting. It turns out the lanterns take off pretty quickly and soon just looked like small dots in the sky. Once I got the shots of the launch I quickly got the camera back down and tried to grab some images of the remaining participants on the ground. There is something quite beautiful about the glow cast off from the lanterns and the entire setting looked quite beautiful for those brief moments. In the end it was a bit of a pain to drag some of that extra gear out there but it was totally worth it! That night 1000 people were taking pictures and I got a shot that nobody else has. That always makes me feel good.